The A/R Customer Inquiry screen provides all the information that exists for a customer in your Sage 300 system. This screen offerings a large amount of customer information on several tabs. 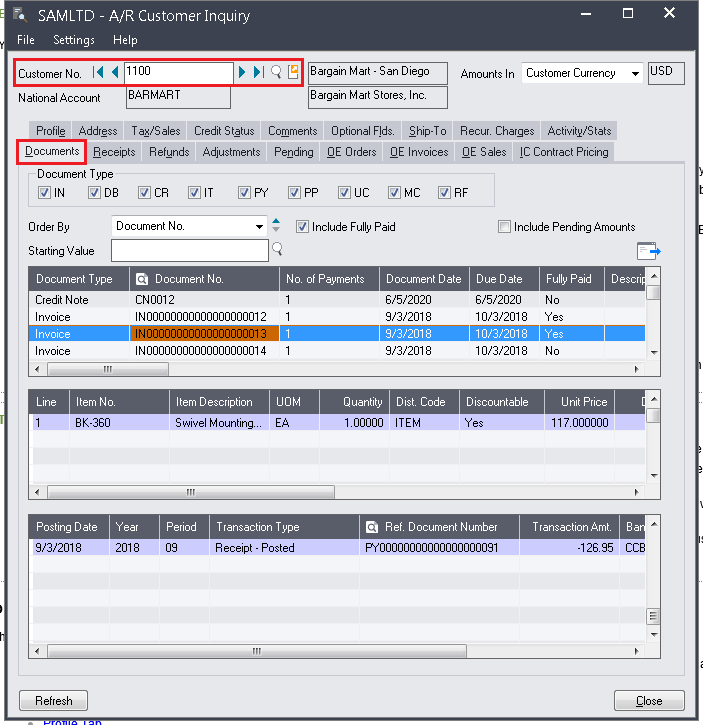 In this blog we will discuss about ‘Documents’ tab which gives us the information about the invoices, credit notes, debit notes, interest charges, receipts (including unapplied cash, prepayments, and miscellaneous receipts), and refunds that have been posted to a selected customer’s account. 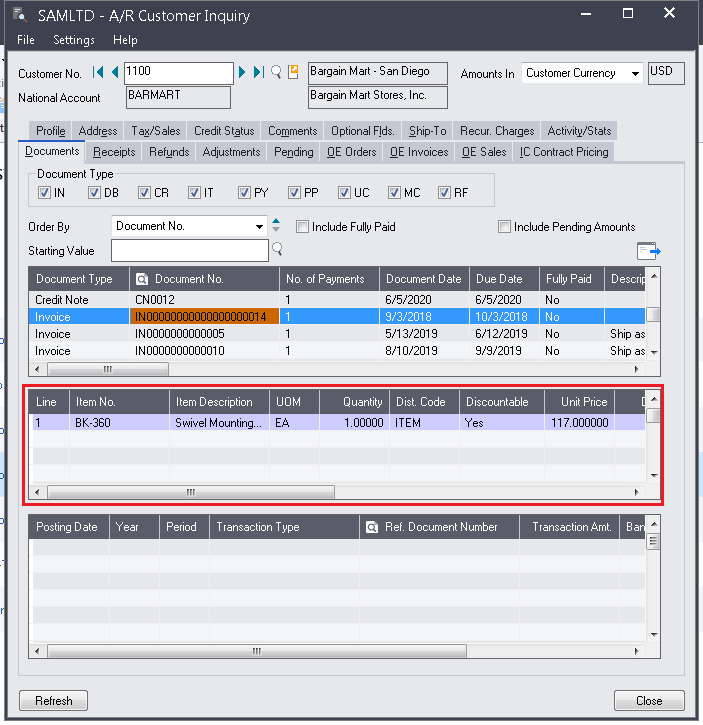 Go to Account Receivable -> A/R Customers -> Customer Inquiry. The Documents tab contains a list of AR invoices, credit notes, debit notes, interest charges, receipts (including unapplied cash, prepayments, and miscellaneous receipts), and refunds which have been processed for selected customer. On the document tab first grid lists the AR documents according to filter condition applied on filter panel, which has one line summary information like Document Type, Document Number, No. of Payments, Document Date, Due Date, Fully Paid etc. for each AR Document. 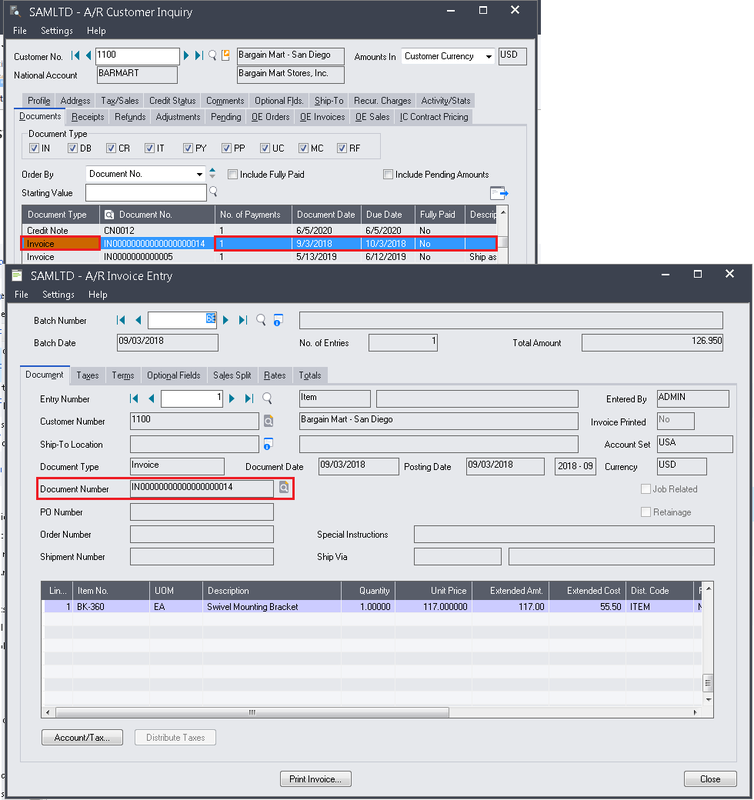 User can drill down the AR Document by double clicking the selected row (except “Document No” column) to view the detail information about AR Document on “A/R Invoice Entry” and “A/R Receipt Entry” screen. 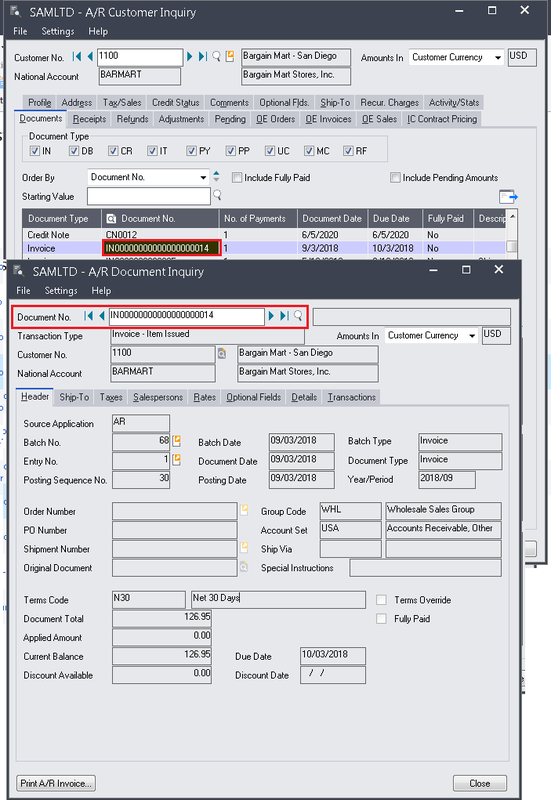 User can also drill down the AR Document Inquiry by double clicking on Document number column of an each row for detail information of AR Document Number. Second grid lists all the Items/Distribution code of selected AR documents on first grid, which has one line summary information like Item Number/Distribution code, Item Description, UOM, Quantity, Dist. Code, Unit Price etc. The third grid lists all the transactions that have been applied to the document you select in the first table, which has one line summary information like Posting Date, Year, Period, Transaction Type, Reference Document Number, Transaction Amount, etc. User can also drill down the applied AR Document by double clicking on Ref. 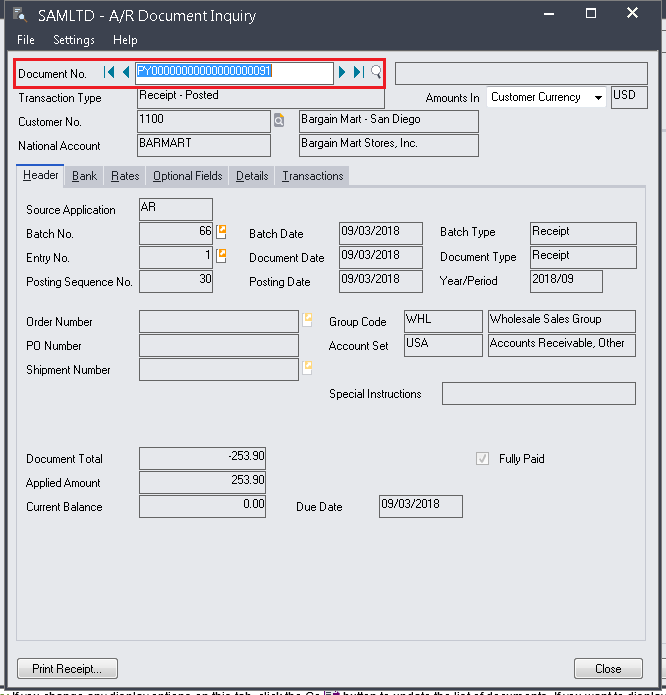 Document number column of an each row for detail information of applied Document. Filter the list by document type. Specify the order in which to list documents, and the number, date, or balance with which to start the list of documents. Display amounts in your company’s functional currency or in the customer’s currency. Choose whether to show fully paid documents. 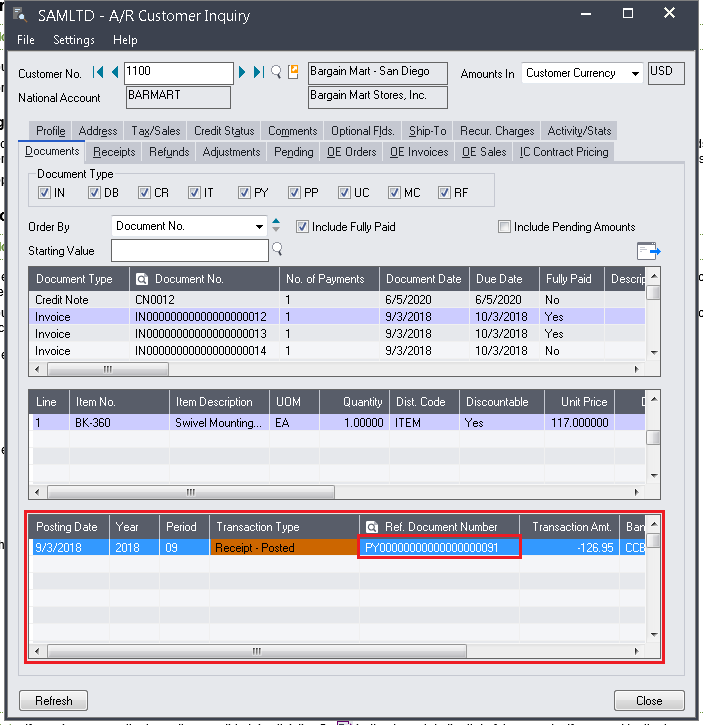 Choose whether to show amounts from pending transactions that will be applied to documents when they are posted. Note: – If you change any display options on this tab, click the Go button to update the list of documents. If you want to display recent changes that you or other users enter, click the Refresh button.